Boeing B 757-200 is a twin engined,single aisle medium to long range airplane.Boeing B757 and B767 were developed, so both share the same technologies.Engines are avalable from Rolls Royce and Pratt & Whitney .The wing of B757 is less swept and is thicker through the center than earier aircraft permitting a longer span . The flight deck is designed for two crew member operation ,pioneered the use of digital electronics and advance displays which increased reliability and advanced features compared to older electro-mechanical instruments. In july 1990 FAA granted 180-minutes ETOPS for Rolls Royce engines and for Pratt & Whitney Engines in April 1992. Both they were received 120 minutes granted before.The first delivered B757-200 was on December 22,1982 to Eastern Airlines. 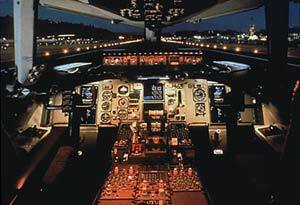 Boeing B757-300 is a twin engined , single aisle, medium sized airplane and was launch in September 2, 1996. The B 757-300 is a stretched version of B 757-200 ,has 23 feets 4 inches (7.1 meters) longer than B 757-200. The extra length allowed it to carry 20 percents more passengers.Both models, B757-200 and B757-300 have the same flight deck and operating systems. Because of the comalnality,many airlines operates both B757 and B767 airplanes.The maximum takeoff weight of B 757-300 is increased to 272,500 lbs (123,600 kg). The aircraft's wings,landing gear and portions of its fuselage have been strengthened and new wheels,tires and brakes added to handle the extra weight. Because the airplane is longer, a retractable tail skid similar to B 777-300 was added.The flight deck of B 757-300 is like that of B 757-200 and is designed for two-crew member operation and furnished with digital electronics displayed each pilot and co-pilot has a pair of displayed. 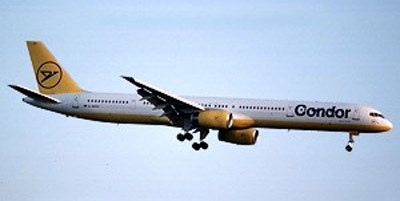 Boeing delivered the first B757-300 to Condor Flugdientst in March 1999. Boeing delivered last B757 to Shanghai Airlines on April 2005 and be number 1050. Boeing announced to close production of B757 on year 2003. 1 nm. (nautical mile) = 1.15155 miles, 1 kt (knot) = 1.15155 mile / hr.